Who would you rather have on your team in the age of salary cap limitations? 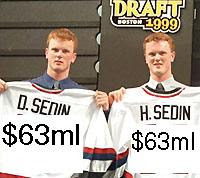 With salaries reaching an all-time high and free agency upon us, it is rumored that Vancouver's Sedin twins are looking for twelve-year, $63 million each as a package to re-sign as Canucks -- to guarantee the remainder of their careers as brothers on & off the ice. I wonder what the open market would pay for these guys, which is roughly $5.25 per year -- a pretty good deal for some of the most consistent scorers in the game. 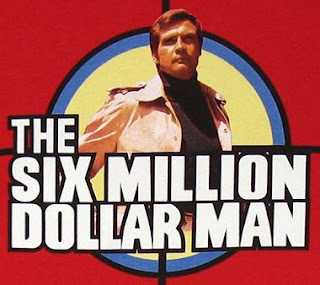 One thing is for certain, the Rangers cannot afford them. Go here, here and here for the latest on the 'bionic twins'. It's amazing how w/e detroit does, other teams follow, even if it's stupid. Decade contracts in the NHL are disasters waiting to happen. How great would that coup be? If the Rangers managed to unload Redden (or change his travel plans to Hartford rather than NY) and signed these 2 to that kind of deal? I would take these guys in a second. a.k.a The Rick DiPietro Syndrome contracts...these guys would be great, but long-term contracts don't mean anything unless the franchise is willing to put their name behind the contracts name (i.e. Ovechkin).